movie review movies naan ee review Naan Ee/Eega/Makhi - The Movie Review. 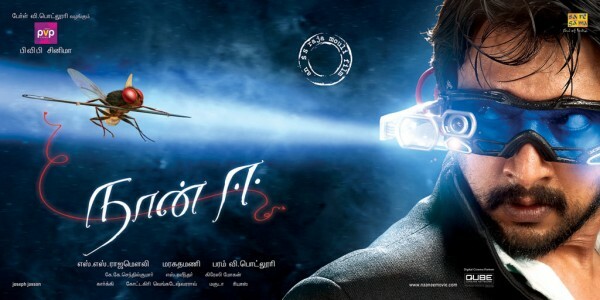 Naan Ee/Eega/Makhi - The Movie Review. Before I start ,I would like to inform you guys that few months ago I was in Chennai for some reasons. While roaming through the Chennai streets with my camera ,I came across a poster which grabbed my attention. This was the poster of a movie called 'Naan EE' . When I looked at it for the first time ,I was feeling weird and funny at the same time. It was rather unusual and kiddish. It showed a house fly as the protagonist. After watching this movie ,I take my words back. This is a movie of true class and its a master peice. This movie features Kannada actor Sudeep, Naani /Naveen and South Indian beauty Samantha Ruth Prabhu. Sudeep is a womanizer and a famous business icon who seems to be a babe magnet. Girls fall for him easily because of his fame and name. He is a rogue who married a woman because of her wealth and eventually kills her. When his partner asks him the reason for this particular charm,then he narrates the story of his wife. Samantha (Bindu) is a micro artist who runs an NGO called PROJECT 511. It is a group of youngsters who help young school kids for their basic necessities such as notebooks ,pencils etc. Our hero Naveen (Nani) is the next door neighbour of Bindu who sets up fire crackers. Nani admires Bindu and follows her like crazy for 2 years. He watches her from sidelines but Bindu teases him.One such day Nani as usual gives Project 511 a monthly donation of Rs 15. Bindu's sister-in-law informs him about Sudeep consturctions and asks her to talk to them for donation. Following her Sister-in-Laws words, Bindu meets Sudeep, the womanizer. The music which plays during their meet is fabulous and breath taking. Bindu asks him for donation for her NGO and Sudeep without thinking hands her a cheque of 15 Lakhs. Sudeep insists that he wants to observe their NGO activities and he tries to befriend Bindu. Nani follows Bindu like crazy and never misses a chance to observe her. Bindu ignores him everytime Nani talks to him. They both talk to each other through text messages while they know each other.The music score is soothing and full of peace. Sudeep calls Bindu for a lunch. Nani is seen there setting up fire crackers for the hotel .Bindu stares at him and Nani indirectly talks to Bindu through the waiters and the managers. Bindu ignores Sudeep and stares Nani which angers Sudeep. Once for all Sudeep comes to know that she is watching Nani. This hurts him intensely and Bindu is completely unaware of what Sudeep told him. Sudeep targets Nani and stabs him to death. It is the same day when Bindu proposes Nani, but our hero is already dead. She calls him and informs him that she teased him for 2 years whenever he followed her and she loves him. The next day she gets the biggest shock of her life when she comes to know about Nani's accident ( made up story by Sudeep and co). Nani is reincarnated as a house fly. The efforts he takes to get adapted to his new life is commendable and it just takes you to a beautiful ride.The fly is too cute and adorable. The way it amuses you is speechless. Nani (as a fly) targets Sudeep. He harrasses him and Sudeep soon turns into a paranoid. He is mentally unstable to such an extent that he roams around with HIT spray. He messes up with the investors and all his wealth is set ablaze by the house fly. One day the house fly observes tears on Bindu's eyes and takes this opportunity to inform her that he is Nani reincarnated as a house fly. He writes that with the help of her tears. This is completely emotional and made me feel sad.Once again all credits to the back ground score.Now both Bindu and Nani partner with each other and plan to kill Sudeep.A tantric informs Sudeep about Nani's incarnation as fly and asks him to do a 'Homa' to get rid of the fly.The tantric gets killed in a short circut while performing the Homa. Later on Sudeep comes to know that Bindu and Nani are partners in crime who planned to kill him.He plans to kill both of them and the chops the wing of the fly. Nani ( as a fly) sacrifices his life for his love by jumping through a lighted match stick,inflaming itself into a loaded cannon which kills Sudeep. Bindu griefs the fly's death using the remainder of Nani which was the wing. While Bindu goes to work , an eve teaser abuses her. He is soon attacked by a fly. This fly is none other than Nani who is reincarnated again as a fly.Santhanam's entry as Potthu Govindan is a treat and he manages to tickle our funny bone. There is a scene where Sudeep asks his workers if 'Flies' take revenges.This will make you laugh like anything. This is a complete roller coaster ride for kids. Our King Khan SRK himself has recommended this movie. Sudeep has done justice to the role. Samantha is cute especially with her smiles.A very Jovial Nani played by Naveen is too good. I loved this movie and I am damn sure that you would love it too. The animation is too good and the songs are awesome as usual and this is a treat. So its time for the verdict. I give this movie a 4 star for the feel good factor and I never got bored through out this movie. This was fun and will watch it again. though i dint want to go and was fooled to watch this but i enjoyed ! Yes usually I do not write reviews for all movies..Movies which touch my heart deserve a special post from myside. I am sure many like you would have loved this film. This is the movie which has touched my heart for sure. Nice work Buddy. Keep on writing. never thought this movie would turn out to be good!